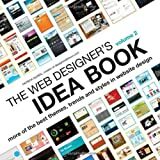 This update to The Web Designer's Idea Book is a source of visual inspiration to web designers to help them see what others have done and how they can adapt those ideas to their own needs. It includes a chapter on web-design principles and a chapter about trends in HTML email design. First, if you don’t have the first one, you’re missing out. They fit together perfectly… hopefully the start of a long series! Like the first volume, this is full of carefully picked examples of the best in modern web design. It’s organized into very clever topics making it the perfect reference book. It’s loaded with screenshots, screenshots, and more screenshots… just as before, but all new, and more recent. In this version, the screenshots are even larger and easier to pick up on detail and text. They’ve also included “Developer Notes” which I think are pretty insightful and in context. If you are involved in web design in any way (even if you’re hiring other people to do it), this book will be super handy. The two editions are the same size and style… they’re intended to be on the bookshelf together. With the two combined, there must be a thousand organized designs to look through. The amount of work that went into collecting such quality work without “filler” junk is astounding. I’m really impressed… if you can’t tell! On the negative side: I’d personally prefer these came in large hardback coffee-table books. While maybe not as handy, it certainly would be great to have around the agency. Maybe after the 3rd edition, they should release a combined volume! This the second of two comprehensive, up to date books. Great for the talented wanna-be web designer or already-is web designer but needs inspiration to get to the next level and see patterns in beautiful web design. Organization of this book is beautifully laid out and easy to reference. The author really knows good web design. The pictures are rich with color. Absolutely love the spot varnish on the cover. Anyone who wants to know where design is going should buy this book. I have ordered several for my friends who are thinking of getting into this field or already are…!